Since she last hoisted the Marj Mitchell Award, Kelly Scott has won two national championships and one world women’s curling title. And that, says Jeanna Schraeder, makes Scott’s Saturday morning repeat all the more special. 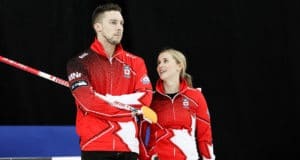 During the 2010 Scotties Tournament of Hearts annual awards brunch at the Marconi Club, the 32-year-old Scott, the Kelowna-based skip of British Columbia’s provincial entry, was again presented with the Marj Mitchell Award for sportsmanship. Scott becomes the sixth repeat winner of the Mitchell hardware. And just like 2006, when she first won the award, Scott was most impressed that it was based on a ballot of her peers. “I appreciate the fact that we’re all out there competing, trying our hardest to beat one another,” said Scott. “And to receive an award voted on by my peers, that recognizes I’m out there with good intentions at all times . . . I appreciate the fact that they consider me to be a sportsmanlike player. Scott, Schraeder, Sasha Carter and then-lead Renee Simons won back-to-back Scotties in 2006 and 2007, and a global crown the latter year in Aamori, Japan. “Being one of her teammates for so many years, I see everything all these other players see as well,” said Schraeder. “She’s got a heart of gold. She’s a very good teammate. She’s very supportive, someone you can always count on. Never has a bad attitude when things aren’t going our way, always positive. impact on the region hosting the Scotties that year. Other two-time winners are Jane Arseneau (New Brunswick), Ann Merklinger (Ontario) and Heidi Hanlon (New Brunswick), while Stefanie Clark (Prince Edward Island) and Alison Goring (Ontario) have won three times. The Mitchell award is often considered an unsung-hero award, but in Scott’s case, given her various championships, it’s more of a nod to ambassadorship — especially while the quartet competed on the world stage at Grande Prairie, Alta., and Aamori. 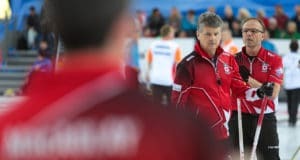 Also announced Saturday morning were the 2010 Scotties Tournament of Hearts’ all-star awards, based on curling percentages through the round-robin portion of the tournament. The first all-star team consists of skip Scott, third Cathy Overton-Clapham (Canada), second Jill Officer (Canada) and lead Dawn Askin (Canada). 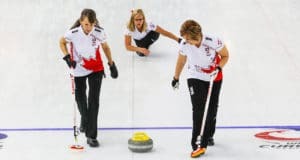 The second all-star team is made up of Jennifer Jones (Canada), third Schraeder, second Carter, and lead Jacquie Armstrong (British Columbia). Previous: The Scotties has some significant history in the Soo!